Sweden will assume the EU's six-month rotating presidency on 1 July, amid great economic challenges and institutional uncertainty for the 27-nation bloc. If ratification of the Lisbon Treaty is completed this year it could be the last six-month presidency. What are Sweden's priorities as it takes over from the Czech Republic? Sweden is taking over the reins of an EU reeling from the impact of the economic crisis - the worst since the 1930s. Prime Minister Fredrik Reinfeldt says the EU must continue with its recovery plan, shoring up banks with liquidity and guarantees, so as to get credit flowing again. High unemployment is an EU-wide problem, so Sweden is anxious to lay the foundations for a new growth and employment strategy, to replace the EU's Lisbon Agenda. The agenda, adopted in March 2000, aimed to make the EU "the most competitive and dynamic knowledge-based economy in the world" by 2010 - but that was before the crisis struck. EU leaders have agreed on a framework for improved financial supervision, and Sweden hopes to get the corresponding EU legislation passed during its presidency. The plan is to install new EU supervisory bodies to identify systemic risks and to monitor individual financial firms, to prevent another meltdown. Sweden also has the job of defending the EU's single market against protectionist pressures fuelled by the economic crisis. The EU has set strict targets for reducing carbon dioxide (CO2) emissions, but Sweden says it will work to get similar commitments from other industrial powers ahead of the UN climate conference in Copenhagen in December. Mr Reinfeldt has said "everyone talks about the importance of reducing emissions and yet global greenhouse gas emissions have not even started to decline". But he welcomes the "encouraging signals from the new US administration". A major Swedish goal is to get EU agreement on measures to help developing countries convert to renewable energy and reduce their emissions. The Copenhagen conference is intended to map out a new global climate agreement to succeed the Kyoto Protocol. Institutional uncertainty overshadows the Swedish presidency, because the Lisbon Treaty has not yet been ratified by all member states. Much depends on the Republic of Ireland's second referendum, expected in October. A win for the "Yes" camp would give the treaty a good chance of coming into effect this year. The treaty would give the parliament a bigger say over the appointment of the new European Commission and would boost the number of Euro MPs from 736 to 754. Sweden says it wants joint EU efforts to tackle pollution in the Baltic Sea and to revive economic activity in the region, which has been hit hard by the financial crisis. "The objective is to adopt an EU Strategy for the Baltic Sea which will contribute to a cleaner sea and make the region more economically dynamic," the Swedish government says. 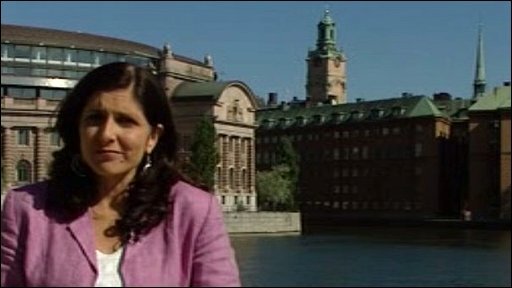 Sweden plans to promote a common asylum policy "characterised by legal certainty and transparency". It wants to boost EU co-operation on migration through a "Stockholm Programme," covering border controls, visa policy, asylum and law enforcement.